We are happy to invite you to the launch of Tombolo Presses new publication, an artist book by Arthur Fouray. 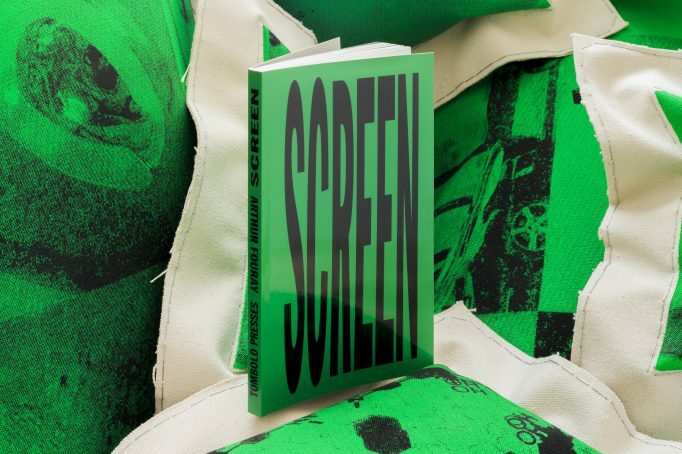 Its title, “Screen”, embodies his artistic process which spreads here across two main formats : painting/serigraphy on cushions and the artist book. The publication sets a comprehensive entry point into a research Arthur Fouray began in 2015 with his solo show “Spectre” at Espace Quark, Geneva. Through art and decoration history, he questions the shift between painting before the industrial revolution and the cinematographic experience. He proposes to the spectator an art experience which skips interaction by teasing the unsaid. The launch of the book is accompanied by a talk between Rachel Walker and Arthur Fouray. A bookshelf will display books published by Tombolo Presses in recent years. Arthur Fouray is a French artist born in 1990. His practice analyses through paintings the exhibition format. He is also curator at DOC Paris, France. In 2015, he co-founded the artist-run-space Silicon Malley in Lausanne, Switzerland. Rachel Walker is a curator and art historian based in Berlin. Originally from Brussels, she holds an MA from the Courtauld Institute in London. Formerly director at DUVE Berlin, she has worked at König Galerie and is currently Gallery Liaison at Artsy. She has recently curated exhibitions at Frankfurt am Main and Horse and Pony Fine Arts. Co-founded in 2013 by Alexandru Balgiu, Thierry Chancogne, Brice Domingues, Sacha Léopold and Pascal Trutin, Tombolo Presses is a publishing house expanding the web revue “Tombolo” with the affinities and contradictions of the practice & reflection of graphic design. This association brings editorial, curatorial projects produced with the energy of artists, graphic designers, theorists, students & teachers, all active on theoretical and exchange platform “Tombolo”. This structure’s ambition is to present experimental publications and/or transitional in the field of graphic design extended to visual arts. The image as text and text as image. This entry was posted	on Saturday, May 13th, 2017 at 4:03 pm	and is filed under books, events, Motto Berlin store. You can follow any responses to this entry through the RSS 2.0 feed.